The PQI Blog is published as a forum for sharing perinatal research updates, patient stories, and perinatal QI tips. Subscribe to the PQI Blog by going to: "Sign-Up" and register as either a Basic (Free), Health Professional or Premium Facility Subscriber. In 2017, Angie Wise, BSN, RN was working as a mom/baby nurse and the charge nurse at a small hospital in Texas. While she was reviewing results of the Hospital Consumer Assessment of Healthcare Providers and Systems (HCAHPS) survey, she discovered that patient satisfaction scores were plummeting. She decided to look for a trend in her unit that could be changed to improve patient satisfaction. Angie found that the discharge process was not adequately meeting patients’ needs, due to limited time and constant interruptions of the nurses. Around the same time, Angie became aware that there were high rates of maternal mortality in both the U.S. and Texas. She wondered what the correlation was between discharge education and maternal mortality. After some research, she learned that improved discharge education could play a major role in reducing maternal mortality. She wondered, “Before [patients] go out the door, what can we do to improve our score and lessen the trend of maternal mortality?” She realized improving discharge education was the answer! Angie was excited to discover that a tool had already been created to educate nurses about discharge education. After watching the Institute for Perinatal Quality Improvement’s Improving POSTBIRTH Education module, Angie thought, “This is one area that I can implement into my bedside nursing.” She felt that a quality improvement (QI) project aimed at improving HCAHPS scores, related to discharge education, would have positive impacts on nurses and patients. Angie was a little concerned about getting buy-in for the QI project, especially from more experienced nurses at her hospital. Despite these hesitations, she decided to introduce the idea to her manager. Angie said to her manager, “patients are saying they aren’t being educated.” She even brought documentation and data to support her point. Angie told her manager about the module and explained that improved discharge education would lead to improved HCAHPS scores. Her manager agreed and was eager to implement the module as an online education tool. Once the education department approved the module, all nurses in the unit were required to view it. Angie’s manager asked the nurses to discuss portions of the module during staff meetings. After viewing the module, one dedicated staff nurse got approval to develop a discharge education class using components from the module. The hospital now holds a mandatory class to teach new mothers about warning signs, such as bleeding, depression, and obstructed breathing, for about 45 minutes each day. This has allowed the nurse who teaches the class to discuss topics in more depth than was possible before (when nurses were teaching mothers one-on-one for 5-7 minutes). What advice does Angie give to others who are thinking about engaging in QI projects? It is unacceptable that Black and African American women are three to four times more likely to die during childbirth than women in all other racial and ethnic groups (CDC). The most recently published statistics show that there were 43.5 per 100,000 live births where Black women died compared to 12.7 deaths per 100,000 live births for white women and 14.4 deaths per 100,000 live births for women of other races. The Institute for Perinatal Quality Improvement is working to change this fact. One thing we can do to reduce pregnancy-related racial and ethnic disparities is to ensure that all women we take care of are treated with dignity and respect. But, according to the over 200 stories of maternal morbidity collected and reported by Nina Martin @ProPublica & Renee Montagne @NPR, African American and Black women feel "devalued and disrespected by medical providers." We can show more respect by making changes in how we converse with the women we take care of. We can also make sure that we speak respectfully about the women we are taking care of when conversing with our colleagues. Conversation is where change begins and we have the power to change the conversation. Set Limits about what others are allowed to say around you by establishing a “not in my workspace” rule when it comes to racially disrespectful speech or actions. Practice and prepare, have a plan for how you will act if you see, hear someone being treated disrespectfully. Express your concerns. Discuss, but do not blame others. Apologize if you said or did something that others find hurtful. Uncover and learn from disrespectful comments and actions. It can feel risky to speak up. But, if we are silent, we lose our voice and nothing will change. We also are complicit when we are silent; people assume we agree with what they just said or did. We can apologize if we say something we regret or if we were silent when we wish we would have spoken up. Martin Luther King, Jr. said: "In the end, we will remember not the words of our enemies, but the silence of our friends." Change is possible and change begins when we all speak up. Exactly ten years ago, my husband and I headed to the hospital full of hope and anticipation for the arrival of our first child, a son we named Van. We were a bit apprehensive, as he was arriving 5 weeks before his due date. Earlier that morning, a routine check-up revealed that I was leaking amniotic fluid and there were signs that I was in labor. My obstetrician told us to check in at the hospital that evening at 8pm if things didn’t progress sooner. We packed our bags and shared our excitement with family and friends. On the drive to the hospital I remember thinking to myself, “I hope I survive this.” This was a fear I had expressed many times throughout the pregnancy that was often dismissed as needless worry. Women don’t die in childbirth in this day and age. I was admitted that evening, given an Oxytocin (Pitocin) drip to help labor progress and rested through the evening. The following morning, the on-call obstetrician made his rounds, and after his examination revealed that not much had changed, he placed an intra-uterine pressure catheter to measure the strength of my contractions and a fetal scalp electrode to continuously monitor baby Van's heart rate. My physician decided to wait a bit to see if things would progress. On April 9, 2018, we will celebrate Van’s 10th birthday. He is our greatest and most treasured gift. This is also the anniversary of the moment we embarked on a new path forward. My husband, inspired by our traumatic birth experience, went back to school and is now a Critical Care Registered Nurse (CCRN) and the charge nurse in the ICU where I spent 8 days recovering after Van’s birth. I now run the AFE Foundation full-time and travel across the country speaking about AFE and our cause and attending board meetings for various maternal health organizations. Not a day goes by that we aren’t aware of the blessing of being Van’s parents and are grateful for the opportunity to give back. Do you have a brilliant, evidence-based program that you want to implement at your unit or hospital? Have you received approval from leadership, but need to engage those who will be doing the work? Do you work in an environment where staff might not feel open to sharing ideas in a group setting? If you answered yes to any of these questions, then you should think about hosting a brainwriting premortem session as part of your pre-implementation plans. The brainwriting premortem method was created for a five-year, mixed-methods national quality improvement project. We needed to engage stakeholders to find out how our evidence-based program would fit within the context of their individual organizations. We knew we would not have much time to build rapport with teams since we were only on-site at each organization for 2 days. We also knew that healthcare providers work in environments with significant professional, social, and status differences. This can make some team members not feel safe to voice their ideas without fear of embarrassment, getting into trouble or being punished (i.e., psychological safety). We needed a method that could quickly engage stakeholders, create an environment of psychological safety, and gather feedback from each individual to maximize the effectiveness of implementing of our planned QI project. What I found were two methods commonly used for brainstorming and evaluation: the brainwriting method and the project premortem. Brainwriting is when a group of people get together and write out ideas on a specific topic. The process involves one person writing ideas on a sheet of paper, then passing the paper to other members of the group. Participants are given time to read, reflect and expand on each other’s ideas. The goal of passing papers from one person to the next is to share ideas, trigger new ideas, and prompt innovative and out-of-the box thinking. A premortem is the hypothetical opposite of a postmortem. In healthcare, a postmortem allows the healthcare team to learn what caused a patient’s death. Everyone benefits, except the patient. The same idea can be translated to project implementation. A premortem in a project planning setting comes at the beginning of a project rather than the end, so that the project can be improved rather than autopsied. Unlike a typical problem identification session in which stakeholders are asked what might go wrong, the premortem assumes that the project has been implemented and failed, and asks what did go wrong. The stakeholder's task is to generate plausible reasons for the project's failure. I combined the two methods to create the “Brainwriting Premortem” and set out to test it at 10 Veterans Health Administration hospitals and primary care clinics. During each site visit, we spent time observing staff and interviewing key stakeholders. We ended each two-day visit with a 60 to 90-minute group activity that included sharing information regarding our program, a process mapping activity, and then a 10-minute brainwriting premortem session. Though getting key stakeholders into a conference room together was not easy, once they arrived they were highly engaged and ready to share their knowledge. We placed a pile of papers in the middle of the table and made sure everyone had a pen or pencil. The leader started the exercise by informing everyone that the (proposed) program has failed spectacularly. For 10 minutes, those in the room wrote down every reason they could think of for the failure – especially the kind of things they ordinarily might not mention as potential problems, such as system issues or political hotspots. Participants reviewed others’ written ideas for inspiration or to expand further on a proposed idea by writing on the same piece of paper. If a participant couldn't come up with an idea in a reasonable time period, they returned the paper without writing anything. Once 10 minutes were up, the leader collected the pages and let participants debrief amongst themselves. We were amazed by the results. Across the ten sites we engaged 116 clinicians and administrators (range: 2 to 26; average: 11.6). Participants produced 217 potential barriers to program implementation that fell into ten common themes. The data were hand written and immediately available. After some sessions, participants started brainstorming potential solutions and adaptations we could make to help the program be successful at their site. We took note of the barriers and potential solutions and made changes to our program and educational plans. Because the data was immediately available, we were able to create leadership feedback reports in a short amount of time. Participants looked like they were having fun. The writing appeared to help participants think and provided ideas for other people to comment and expand on. One facilitator noted that participants appeared flattered that they were being asked their opinions, "… almost as if no one had ever asked their opinions before." Another facilitator witnessed "light bulbs going off" when something was read by a participant that they hadn't thought of before. When we surveyed participants after sessions, they indicated they were not afraid to give ideas to the group and were not worried that they would be criticized. The brainwriting premortem method had created an environment of psychological safety. When should you use the brainwriting premortem method? You want to rapidly gather ideas about a new program from those who will be doing the work. Have you ever been a part of a quality improvement (QI) effort that felt like a waste of time? Have you gone to meeting after meeting or collected a lot of data but no changes were ever made? Or have you made changes that did not improve outcomes? Have you wondered what you could do to make QI efforts more effective? While thinking about how to reduce QI-related frustration, I was reminded of when I first became a labor and delivery nurse. Initially I did not understand the physiology behind the patterns I was seeing. I knew how to recognize some fetal heart monitoring patterns, but I was like the proverbial blind man trying to describe an elephant by the small part of the elephant I could feel. The more I knew about maternal and fetal physiology, the more effective I was at adjusting the clinical plan of care when my patients’ conditions would deteriorate or did not respond as expected to the treatments I provided. A knowledge of maternal and fetal physiology helps clinicians tailor care decisions to individual patients. Similarly, an understanding of the “physiology” or science behind QI makes it possible for RNs, MDs, midwives, and other health professionals to more thoughtfully select the QI strategies and tactics they employ to ensure QI success. QI, like taking care of patients, is dynamic and context specific. Implementation and improvement science theories, frameworks, and models help “explain how and why implementation succeeds or fails” and helps us identify “strategies to achieve more successful implementation” (Nilsen, P., 2015, pg.1). Implementation Theories (used for predicting and explaining) outline a fact or a set of facts and ideas that either explain or predict implementation effectiveness. Research, as outlined in theories is the solid foundation for all QI efforts. Implementation Frameworks (used for planning and adjusting the QI implementation strategies and tactics) help describe and identify potential QI implementation barriers and facilitators. Implementation frameworks are useful for identifying the implementation and improvement science research study results that are most relevant to the QI effort. L. Damschroder, et al.’s Consolidated Framework for Implementation Research (CFIR; www.CFIRguide.org). Implementation Process Models (used as checklists and as a guide for writing up the QI Plan) are used to guide the planning and evaluation process that will be used to improve outcomes and translate research into practice. Process models do not predict implementation effectiveness or describe the causal mechanisms of various implementation activities. Implementation frameworks and process models are usually described as occurring in a linear fashion, or step 1 follows step 2. However, the various components of the frameworks and models are messier and much more interactive. We can take the mystery out of the implementation process by expanding our understanding of relevant theories, frameworks, and models. Knowing more about implementation science will help us more quickly and effectively apply evidence-based practices. Simply acknowledging that change is hard and messy does not go far enough to ensure that a QI leader is effective. Teaching QI leaders about QI tips and tools also does not adequately prepare them to decide which tools to use, and when. It is essential for QI leaders to know the physiology of QI by learning about theories and frameworks. A foundation in implementation science will help them know how to select and use the QI implementation tools effectively and what to do when barriers to successful implementation are identified. Clinicians’ implementation of evidence-based practices is a high stakes endeavor. Patients want and need clinicians taking care of them who are following the latest evidence-based guidelines. Clinicians also do not have time to waste. We at the Institute for Perinatal Quality Improvement (PQI) are working to expand the use of improvement science to speed up the time it takes to translate research into practice and enhance implementation effectiveness. QI leaders who learn the physiology of change are better prepared to make more thoughtful and tailored decisions. Learning implementation science is critical because QI saves lives! Register to attend the Implementing Perinatal Quality Improvement conference on 2/1/18. Sign-up for FREE PQI updates. Subscribe and support our efforts by signing up as an individual Health Professional subscriber (RNs, MDs, Midwives or other health professionals) or as a Premium Facility subscriber. Individual Health Professional and Premium Facility subscribers receive Action Briefs, have full search capability on our QI Project Maps, receive event discounts, and can subscribe to the PQI Blog. Thank you to Zola D. Golub, MEd, RN, IBCLC and Mary Ellen Boisvert, MSN, RN, CLC, CCE, members for their review and contributions to this blog. Damschroder, L.J., Aron, D.C., Keith, R.E., Kirsch, S.R., Alexander, J.A., & Lowery, J.C. (2009). Fostering implementation of health services research into practice: a consolidated framework for advancing implementation science. Implementation Science.7(4). Graham I, Logan J, Harrison M, Straus S, Tetroe J, Caswell W, Robinson N (2006). Lost in knowledge translation: time for a map?. Journal of Continuing Education Health Professionals. 26: 13-24. 10.1002/chp.47. Guidry, M., Vischi, T., Han, R., & Passons, O. Healthy people in healthy communities: A community planning guide using healthy people 2010. Washington, D.C.: U.S. Department of Health and Human Services. The Office of Disease Prevention and Health Promotion. Accessed: 12/27/17. Harvey, G. & Kitson, A. (2016). PARIHS revisited: from heuristic to integrated framework for the successful implementation of knowledge into practice. Implementation Science. 11(33). Harvey, G. & Kitson, A. (2015). Implementing evidence-based practice in healthcare: a facilitation guide. Routledge Taylor & Francis Group: New York. Langley, G.J., Moen, R.D., Nolan, K.M., Nolan, T.W., Norman, C.L., Provost, L.P. (2009). The improvement guide: a practical approach to enhancing organization performance. Jossey-Bass: San Franscico, CA. Nilsen, P. (2015). Making sense of implementation theories, models, and frameworks. Implementation Science. 10(53). Rogers, E.M. (2003). Diffusion of innovations. 5th Edition. Simon and Schuster. ISBN. 978-0-7432-5823-4. Rycroft-Malone, J. & Bucknall, T. (2010). Models and frameworks for implementing evidence-based practice: linking evidence to action. Wiley-Blackwell: United Kingdom. Stetler, C.B. (2001). Updating the Stetler Model of research utilization to facilitate evidence-based practice. Nursing Outlook. 9(6), 272-9. Titler, M.G., Kleiber, C., Steelman, V.J., Rakel, B.A., Budreau, G., Everett, L.Q., Tripp-Reimer, T., & Goode, C.J. (2001). The Iowa Model of evidence-based parctice to promote quality care source. Critical Care Nursing, Clinics of North America. 13(4), 497-509. White, K.M., Dudley-Brown, S., Terhaar, M.F. (2016). Translation of evidence into nursing and healthcare, 2nd Edition. Springer Publishing Company: New York. Wiener, B.J. (2009). A theory of organizational readiness for change. Implementation Science. 4(67). *There are links to open access articles or website. Overuse of induction of labor increases the risks of a woman having a postpartum hemorrhage. Below is Lilly’s (not her real name) story, which illustrates that women may be pressured by medical providers to have an induction of labor, even when there isn’t a medical indication. Waiting for labor to begin on its own and letting babies pick their birthdays reduces the overuse of inductions of labor. Lilly’s Story: In April 2012, while on a trip to Boston, I found out I was pregnant with my first child. After trying for some time to get pregnant, we were SO excited. I quickly began researching obstetrical providers in Washington, DC where we live. My gynecologist had recently stopped providing OB services, so I needed to find someone new. I consider myself a well-educated consumer of healthcare. I’m fortunate enough to have financial resources like private insurance and a two-person income household. At the time, I was working for a women’s health organization, and I was blessed to personally know some of the most dedicated, thoughtful OB nurses in the country. I asked them for suggestions. I attended educational sessions at area hospitals, met with midwives and physicians. I did my homework. I know how important prenatal care is. I know that the choice of a hospital and an OB provider can greatly impact pregnancy and birth outcomes. I ultimately selected a physician who practiced at a large academic medical center. He worked in a practice with nurse-midwives and seemed very interested in understanding the kind of birth experience I wished for. He said he would be at my birth come “hell or high water.” That each prenatal visit would be with him. I liked the idea of establishing a personal relationship with him and throughout the course of my pregnancy, I was able to do just that. He was fantastic. At my last prenatal visit – the day before my due date – I went to his office. I was feeling great; there were no signs of labor. I was secretly happy about this. I wanted my parents, who lived 12 hours away, to be present for the birth. They were en route and I felt confident that they would not miss a thing. I got to the hospital and was hooked up to the monitors. I told the nurse that I didn’t want to be induced. She called the doctor; he came in to tell me that the risk of stillbirth increases with “each passing day” and that induction was the “safest” next step. When he left the room, I talked to the nurse about what he said. I asked if the baby looked okay. If I was okay. If I should get an induction. I texted a midwife colleague. I asked her if I was going to have a stillbirth if I waited for labor to start on its own. Both reassured me that I did NOT have to get the induction. That it was my decision. The nurse told me the baby and I looked good and I went home, grateful for that nurse and my midwife co-worker. I also wondered what happens to the people who don’t have all of the resources I do. From there, the doctor said that I would need to come to the hospital every-other-day for a non-stress test. In the meantime, I was taking long walks, eating spicy foods. I even tried castor oil to get labor started. Two days later, with my parents and husband in tow, I went back to the hospital per the doctor’s instructions. After an hour or so of monitoring, the doctor came to tell me that my fluid levels were low. That I needed an induction. Now. Again, I cried. I didn’t have the strength to push back. My parents were worried that I was questioning the doctor’s advice. Again, it was a nurse who came into the room, saw me crying, and asked, “What’s going on here?” My husband told her than I didn’t want to be induced, but my fluid levels were low. She asked how much I had to drink that day, fetched an enormous pitcher of water, and with a twinkle in her eyes said, “Start drinking mama.” My fluid levels came up and an hour later, I was walking out of the hospital once again, thanks to a nurse. This pattern of activity – the non-stress test, a recommendation for induction coupled with a conversation around still birth, happened one more time. Until January 20th, when I woke my husband up in the middle of the night to tell him that I was in labor. He kept track of my contractions, called the hospital, and woke my parents who had made it safely to my home. It was time to go into the hospital again, but this time on my terms. My daughter was born less than an hour after we arrived at the hospital, perfectly healthy, surrounded by family and so much love. Now three years old, my daughter often asks me to tell her the story about the day she was born. I tell her about how excited we were to have a baby, how she’s perfect in every way. About her pretty, long fingers and brown hair. I also tell her about the “silly doctor” who wanted to pick her birthday, and even more important - the wonderful nurses who knew that SHE should be the one to pick her birthday. She picked January 21st. According to research by Bateman et al., about 78 percent of all postpartum hemorrhages are due to uterine atony. Women with long inductions of labor are at greater risk of having uterine atony. Obstetric hemorrhage remains a leading cause of maternal deaths and a cause of death where there is a strong chance of altering the outcome.There has been a lot of work nationally to reduce hemorrhage-related maternal morbidity and mortality, including the release of the Council on Patient Safety in Women’s Health Care’s Obstetric Hemorrhage Maternal Safety Bundle. Implementing the maternal safety bundle elements in your hospital, clinic or practice is a great way to reduce hemorrhage-related morbidity and mortality. We also need to work upstream to prevent obstetric hemorrhages. One of the simplest ways to reduce the need to rescue women from a postpartum hemorrhage is to stop inducing labor without a medical indication. Inductions and augmentations of labor should be reserved for situations when the health of either the baby or mother indicates there is a need. Women with healthy pregnancies do not need an induction of labor when they are at term and their baby is healthy. Consumer Reports recently quoted Debra Bingham, Founder of PQI, in an article titled What to Reject When You Are Pregnant in recommendation #4, to reject "inducing labor without a medical reason." As Debra stated in the National Institute for Child Health and Development video, "Is it Worth It?," why add risks to your health if you don't need to? Waiting for spontaneous labor is safer for healthy moms and babies. Healthy babies are better at selecting their birthdays than anyone else is. Add your QI Project to our maps. All perinatal QI projects are welcome. Adding your QI Projects to our maps will help others be able to connect with you. Corinne (not her real name) was 28 years old and excited to give birth to her first child, a baby girl. Corinne’s pregnancy was uneventful, she and the baby were both healthy throughout. When she was 39 weeks pregnant, Corinne felt contractions that started to become regular, and around 4am she and her husband Derek (not his real name) decided to go to the hospital. Corinne was in early labor (1 centimeter dilated and 80% effaced) and was given the choice to go home or stay in the hospital. Corinne chose to stay, and was told to change into a gown, was put in a bed, and attached to the electronic fetal monitor in her room. She did not think she could get out of bed and move around. The next morning, Corinne was only 2 centimeters dilated. Her physician offered her the option of breaking her water and having her labor augmented, and she agreed. As labor became more uncomfortable, she decided to get an epidural, even though she was still only 2 centimeters dilated. Her labor slowed down after the epidural and she needed more Oxytocin. Though she was making progress, Corinne still had not given birth by the next day and was starting to show signs of an infection. After a few more hours, her physician recommended she have a cesarean birth because she hadn’t made much labor progress and because Corinne’s baby’s baseline heart rate had become elevated and there were some decelerations. Corinne agreed to this plan. During the surgery, her bladder was accidently cut. So, after giving birth she had to have a catheter in place longer than usual, which made it difficult for her to walk around. She also needed antibiotics to treat the infection. Corinne was excited to have her little girl born, but her baby was having some trouble breathing due to fluid in her lungs and also needed to receive antibiotics to treat the infection. This meant that Corinne only got to have a quick look at her baby girl Briana before she was taken to the NICU. Since Corinne was recovering from major surgery, a cut bladder, and an infection it was difficult for her to visit her daughter in the NICU. This made breastfeeding difficult and it was not well-established before they both went home from the hospital. Both Corinne and her daughter Briana were discharged home 4 days after birth. At home 5 days after giving birth, Corinne was still exhausted and did not sleep well. The next morning, she started experiencing shortness of breath and obstructed breathing. She wondered if she should go back to the hospital but did not want to bother anyone, and she really didn’t want to be readmitted to the hospital. She called her doctor’s office and the receptionist agreed that she could try resting awhile to see if that made her feel better, and to call back if her symptoms did not go away. Corinne started feeling worse so her family decided to take her to the emergency room. Before they could get in the car, Corinne collapsed and died. Derek called 911 but it was too late. Corinne could not be resuscitated. She died of a pulmonary embolism. According to a recent study published in Obstetrics & Gynecology, the management of labor and delivery patient flow in hospital settings may put women at increased risk for a variety of complications and for cesarean births. (2) to measure the relationship between labor and delivery unit management and maternal outcomes. The results of the study revealed that three factors ­– nursing, patient flow, and unit culture – were associated with either better or worse patient outcomes. In Corinne’s situation, there was not one single factor that led to her death, but a cascade effect of decisions that ultimately increased Corinne’s risk for a pulmonary embolism. The findings of this recent study suggest that while some management practices may negatively impact maternal health (e.g., by increasing rates of cesarean delivery), others may positively impact maternal health (e.g., by decreasing length of hospitalization). More research is needed to determine why these differences in management approaches exist and which management practices will have the greatest effect on eliminating the overuse of cesarean births. These study findings are also consistent with the recommendations included in the Council on Patient Safety in Women’s Health Care’s Maternal Patient Safety Bundle titled: Safe Reduction of Primary Cesarean Births that state every hospital and unit should “Build a provider and maternity unit culture that values, promotes, and supports spontaneous onset and progress of labor and vaginal birth and understand the risks for current and future pregnancies of cesarean birth without medical indication.” In Corinne’s case, the cesarean ultimately was needed, but there were many decisions in the management of her labor, such as offering for her to stay in the hospital and breaking her water before she was in active labor, that influenced the progress of her labor and ultimately led to her having an infection and also a cut bladder in surgery. All of which made her less mobile and thus at greater risk for a pulmonary embolism. In addition, Corinne’s daughter Brianna had to be admitted to the NICU and breastfeeding was difficult: these circumstances lead to poorer health outcomes for newborns. In other words, overuse of cesarean births isn’t good for moms or babies. We at PQI congratulate the many Registered Nurses, Physicians, and Midwives who are currently working to reduce the overuse of cesarean births. But, our national statistics make it very clear that much more work is needed. That is why the leaders of the Institute for Perinatal Quality Improvement (PQI) are working to expand the use of improvement science among Registered Nurses and other perinatal clinicians. If you are working to eliminate the overuse of cesarean births please consider subscribing and entering your QI Project onto our Maps. The QI Project Maps are designed to help Perinatal QI Leaders connect with others working on similar types of QI Projects. Be a part of the solution. Sign-up as a PQI Subscriber. Pin your QI Projects on the Maps. Tara Hansen, a 29-year-old elementary school special education teacher from New Jersey, experienced a normal, healthy first pregnancy and gave birth to a healthy baby boy in March 2011. When Tara didn’t feel well after giving birth, the health care providers she sought help from assumed that the symptoms she described were simply the ordinary “expected' postpartum symptoms. She was considered a healthy postpartum patient and sent home. Six days after Tara gave life, she died of a postpartum infection. Tara had tried to get help and knew she didn’t feel right, but she also did not have sufficient information about postpartum symptoms that are considered red-flag warnings of life-threatening conditions. Her death could likely have been prevented had she received timely, effective treatment, but the clinicians she asked for help did not take her symptoms seriously enough. The tragedy of Tara’s death led Ryan, her devoted husband, and his family to form the Tara Hansen Foundation. They tell the story of Tara’s death because they want her death to motivate change and improve outcomes for all mothers. The findings of a recent study, "Nurses’ Knowledge and Teaching of Possible Postpartum Complications," which surveyed 372 Registered Nurses who care for women during postpartum indicates that nurses would benefit from greater education about postpartum risks. Forty-six percent of the nurses surveyed were not aware that maternal mortality rates have increased in the last decade, and the majority did not know that most maternal deaths occurred postpartum. Two-thirds of the nurses surveyed reported spending 10 minutes or less teaching about warning signs of potential postpartum complications prior to new mothers being discharged from the hospital, which may or may not be enough time to ensure comprehension of such important information. Many women, like Tara, leave the hospital unable to adequately determine if the symptoms they notice after birth are normal and expected, or abnormal requiring urgent or emergency medical attention.Another important factor is ensuring that women are not discharged home from the hospital too early and receive adequate discharge education. Our goal at the Institute for Perinatal Quality Improvement (PQI) is to support leaders in developing and implementing Quality Improvement (QI) projects that save lives. One example of a QI project Dr. Debra Bingham, developed and implemented when working as Vice President of Research, Education, and Practice at the Association of Women’s Health, Obstetric and Neonatal Nurses (AWHONN) was the "Empowering Women to Obtain Needed Care" pilot project. This pilot project was possible due to support from the Merck for Mothers program. The goal of the AWHONN pilot project was to increase women's access to quality information about risks for post-birth complications, especially before discharge from the hospital but after giving birth. Headache that does not get better, even after taking medicine, or bad headache with vision changes. These tools and a description of this program were published in the peer-reviewed journal Nursing for Women’s Health. New mothers need to be encouraged to reach out to their health care provider if they have these or other symptoms that concern them. We cannot predict which women will have a post-birth complication. That is why ALL new mothers need to be encouraged to reach out to their healthcare provider if they have these or other symptoms that concern them. The AWHONN “Save Your Life” handout and the education she received from a nurse before discharge, helped 27-year-old Abigail (not her real name) save her own life. In her second week postpartum, Abigail experienced some of the symptoms, including "shortness of breath," listed as important warning signs on the patient handout under "Call 911 if you have." Abigail was taken immediately to the emergency room, where she was diagnosed with a pulmonary embolus in her right lung. Abigail believes the post-birth education and handout she received before discharge saved her life. Nurses may hesitate to teach women about these signs and symptoms of potential complications because they don't want to scare anyone. However, every new mother needs to be taught which post-birth symptoms are emergencies and which ones are urgent. Start the conversation by saying something like, "Although most new mothers do not experience life threatening complications, I want to make sure that you are aware of the 9 most common warning signs. I also want you to trust your instincts, if you think something might be wrong, seek care." Teaching a new mother this information could save her life! Find links to other related facts and resources here and let PQI know if you would be interested in joining the Postpartum Discharge Education PQI Action Community. Sign-up as a Basic (FREE) or Premium PQI Subscriber and pin your postpartum discharge education or other perinatal QI projects on our QI Project Maps. The Institute for Perinatal Quality Improvement (PQI) is honored to have received support from the Tara Hansen foundation to launch the New Jersey Quality Improvement Project Maps pilot program. Thanks to this generous gift, New Jersey is the first state to work with PQI and launch a state-wide PQI Mapping effort. Register to attend PQI's free education on: Improving Postpartum Education about Potential Maternal Complications. Mothers and newborns depend on quality improvement (QI) leaders to implement safety bundles and other evidence-based care practices. Based on personal experience, I know that leading and implementing QI initiatives can be rewarding but also challenging. When I was the Director of Maternal Child Health Nursing for two hospitals in New York City, there never seemed to be enough hours in the day to accomplish all that I needed to do. I was kept busy just doing the basics of making sure there were skilled RNs on duty 24/7 and ensuring there were adequate supplies. Not to mention dealing with the unexpected, such as surges in patient volume requiring us to open up a satellite unit, a blizzard that shutdown the city's public transportation systems keeping staff either at work or at home, a power outage across the Northeast, and being a part of the hospital's command center deciding moment by moment how to respond moment by moment following the attack on 9/11. In the midst of all of this pressing and critical work I wanted to make time for QI. But, it was difficult, and sometimes impossible, to get everything done that really needed to be done. I often worked on QI projects on my own time. When I decided to go back to school and get a Doctorate in Public Health, the focus of my dissertation work was exploring how to increase the QI effectiveness of front-line perinatal clinical leaders. I spent years reading the research and honing my knowledge of improvement science. What motivated me then and motivates me now is that I know that QI saves lives! When running state and national QI efforts, I have found that my experiences are not unique. Perinatal QI leaders at multiple hospitals describe facing these same types of challenges.That is why PQI was formed and why we have developed the following solutions to address four common challenges QI leaders encounter. Our perinatal QI Project Maps are a NEW and INNOVATIVE way for QI leaders throughout the world to communicate and collaborate with each other. The typical three year lag time between doing and publishing is too long when the lives of mothers and newborns depend on us to spread and implement needed improvements in care. In addition, many QI leaders who are overworked make the choice to keep doing rather than spending time writing up what they did. So we have limited opportunities to learn from each other what worked and did not work. 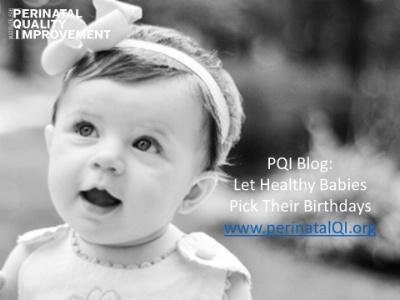 Be one of the first perinatal QI Leaders to put a project (or two) on the Institute for Perinatal Quality Improvement (PQI) QI Maps! The PQI Action Briefs are designed to help keep staff engaged, save time, and help identify perinatal quality and safety blind spots in facilities where women give birth. Each Action Brief includes a Case Study (in a Power Point slide set that can be customized), discussion notes for the facilitator and an Action Template with suggestions for a step-by-step approach. PQI will also be releasing regular updates with tips and tools designed specifically to help perinatal QI leaders. Check out our blog posts and subscribe to the PQI Blog. Visit our website regularly to get access to the FREE QI Tools PQI publishes. Whether you are an expert at QI or a novice – you do not have to be alone on your journey to improve perinatal outcomes. Schedule consultations with PQI implementation experts. Host or attend a PQI Implementing Perinatal QI Conference. A few practical tips and tools can save you hours. The PQI consultations can also help you develop a plan that includes QI strategies and tactics tailored to the needs of your organization or state. Despite these and other QI challenges, I am continually impressed by the dedication of countless clinicians who are continually striving to improve structures and processes in an effort to improve perinatal outcomes. We at PQI are working to expand the use of improvement science and reduce QI implementation barriers. We want to help make sure everyone's efforts are as effective as possible. Rachel (fictitious name) was having her 2nd baby. She was 40 weeks pregnant and had an induction of labor because she was tired of being pregnant. After giving birth to a healthy baby boy she started to bleed heavier than usual. She was given a dose of methylergonovine maleate (MethergineTM) and the bleeding slowed down enough that her physician decided to go home. However, after about a half hour the nurses called her physician to come back to the hospital because Rachel's bleeding became heavier. When the physician returned to the hospital he performed a Dilation and Curettage and obtained a minimal return of tissue and Rachel was given more methylergonovine maleate (MethergineTM). The heavy bleeding continued, so blood was ordered. However, it took a while for the blood to be given because the tubing did not fit and they had difficulty starting a 2nd IV. Three hours after Rachel gave birth she died of postpartum hemorrhage due to delays in treatment. Sadly, Rachel’s birth experience is not unique. In the United States, the pregnancy-related mortality ratio rose from 10 deaths per 100,000 live births in 1990 to 17.3 deaths per 100,000 live births in 2013 (Centers for Disease Control and Prevention, 2016), which is more than double the 1978 rate of 7.2 deaths per 100,000 live births. In addition, researchers of U.S. maternal mortality trends found that the “raw, unadjusted data from all states regardless of whether they revised their death certificates resulted in a reported U.S. maternal mortality rate” of 21.5 deaths per 100,000 live births in 2014 (MacDorman, Declercq, Cabral, & Morton, 2016, p. 450). Even more tragically, a significant racial disparity exists in the pregnancy related mortality ratio: Black women have a more than 3 times greater pregnancy-related mortality risk than white women (Centers for Disease Control and Prevention, 2016). Furthermore, many of these deaths are preventable. For example, the North Carolina Pregnancy-Related Mortality Review Committee found that 40% of pregnancy-related deaths in their state between 1995 and 1999 were potentially preventable (Berg et al., 2005), and the Illinois Maternal Mortality Review found that 32.4% of all pregnancy-related deaths between 2002 and 2012 in their state were potentially preventable (Geller, Koch, Martin, Rosenberg, & Bigger, 2014). The mission of the Institute for Perinatal Quality Improvement (PQI) and of the PQI Blog is to expand the use of improvement science in order to eliminate preventable perinatal morbidity and mortality and end perinatal racial and ethnic disparities. Each month, we’ll share perinatal patient stories, publish perinatal QI success stories, or outline perinatal QI lessons learned about the leading causes of perinatal morbidity and mortality. We will also discuss quality improvement initiatives and tools that can help to reduce perinatal morbidity and mortality. Together, we can improve outcomes for mothers and newborns.